ESCO International Ltd has received a purchase order to design and supply two advanced oxidation pilot systems to a petrochemical facility in China. The contract will involve using ozone-based advanced oxidation technologies for the oxidative destruction of VOCs in waste gas stream and TOC in process water for reuse purposes. This award demonstrates again ESCO International’s dedication to advanced oxidation technology innovation and the focus on assisting customers solve waste water and waste gas challenges by developing and offering the right and sustainable solutions. Chlorine and combined chlorine compounds are oxidizing agents which generate undesirable by-products and have harmful effects on industrial processes. 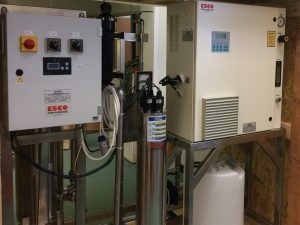 In high purity water treatment systems, the presence of chlorine and chloramines can lead to the deterioration of treatment systems such as ion exchange beds and RO membranes. Traditional treatment methods for the removal of chlorine and chloramines include adsorption by Granular Activated Carbon (GAC) or by addition of chemicals such as sodium metabisulfite. Activated carbon beds are susceptible to microbial growth and vulnerable to break-through, which can lead to serious contamination and costly downtime on manufacturing processes. Sodium metabisulfite generates undesirable reaction by-products in process water which can create perfect conditions for microbial growth in RO membranes and adds critical load on downstream treatment units such as deionizers. This can result in a significant increase in operating, service and maintenance costs for ion-exchange, DI and RO systems, all used for high purity and ultrapure water production and processes. However, UV technology is becoming increasingly popular for the destruction of chlorine and chloramine compounds in industrial applications. This is mainly due to, on one hand, the increased overall costs associated with traditional methods and, on the other hand, on the improved performance of UV lamp technologies and UV reactors design. Positioning UV systems before GAC and RO systems, for instance, has been shown to reduce overall operating, service and maintenance costs without generation of residuals or affecting taste and odor. The use of UV treatment significantly helps increasing the time between cleaning cycles, and extending the life of both the activated carbon and the RO membranes. Due to its undisputable success and efficiency in destroying chlorine and chloroamines and TOC in water, ESCO International was again awarded a contract to design and supply UV systems for an industrial plant in Eastern Europe. The scope of supply included eight UV systems for chloramines and TOC reduction. The TOC UV systems (4 units) were installed along with two pass RO and EDI systems, treating a total process water flow rate of 140 m3/h. The design calls for TOC reduction from 800 ppb down to below 100 ppb. The four (4) chloramines UV systems were designed to treat 120 m3/h of process water containing 2 mg/l of chloramines down to below 0.2 mg/l. ESCO International provides advanced solutions for water disinfection and oxidative destruction of organic pollutants, Endocrine Disrupting Compounds (EDCs), pharmaceutical products, COD, TOC and VOCs reduction. Our comprehensive selection of treatment technologies and solutions include high output amalgam UV systems; medium pressure UV systems; ozone generator skid systems; engineered advanced oxidation processes (AOP); design & supply of ozone and AOP pilot plants and laboratory services. For many commercial and industrial operations, looking at ways to reduce water and wastewater monthly bill costs and ensure compliance with both current and future regulations, water reclaim is essential. A major water treatment challenge encountered in the search for new water sources is the reduction of TOC and COD at one or more locations. The purpose of this study is to show the importance of AOP process design and optimization and the significant implications for the technical/commercial scale design and operating costs for the oxidative destruction of organic compounds, COD and TOC in water and waster waters. Experiments were carried out in two different semi-industrial scale O3/H2O2/UV AOP systems, referred to as new design AOP-NDX and old design AOP-ODX. Both AOP tanks were made of stainless steel. Design flow rate up to 10 m3/h. In this section of the report, we present general results of the oxidative degradation of the model compound and the significant effect of AOP system design parameters on process performance. Laboratory scale studies, where effects of the AOP reactor configuration and critical operation conditions are not studied, provide insufficient information and data for process technical scale up. Large scale experiments were conducted in two different semi-industrial AOP systems. 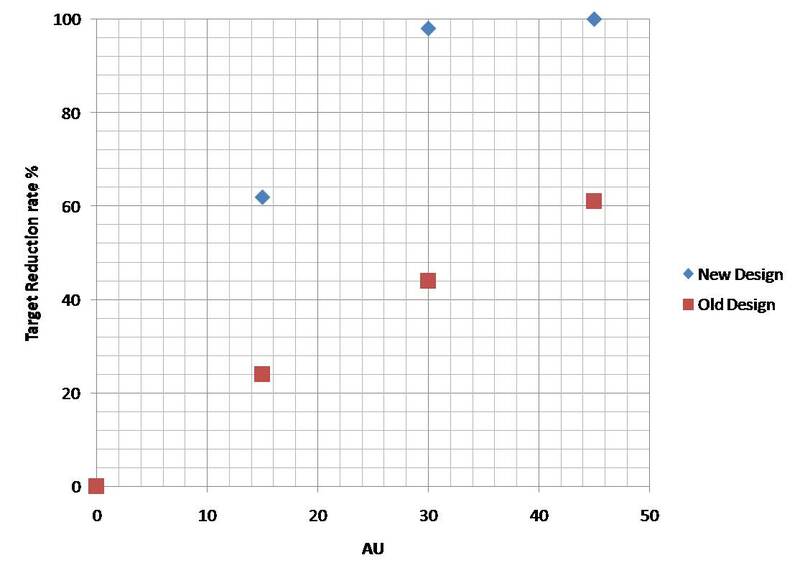 Figure 1 illustrates the effect of AOP design configuration on the target compound reduction rate. Results show that, under similar operating conditions, target compound reduction rates of 98% and 45% were measured for AOP-NDX new design and AOP-ODX old design reactors, respectively. This indicates that AOP treatment efficiency can be significantly improved using the correct design and optimisation approach which can result in increased process performance, hence reduced capital and operating costs. Figure 2 shows the effect of UV power on the process performance for the optimised AOP reactor, AOP-NDX. 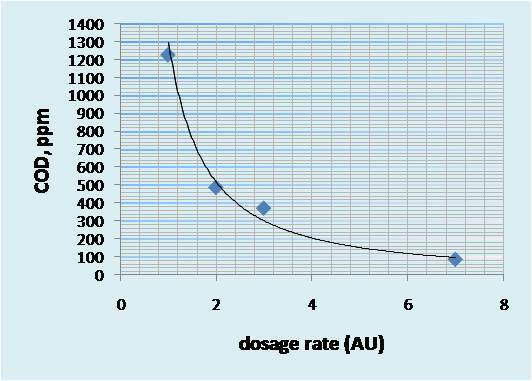 The efficiency of the degradation rate of the target compound is critically dependent on the intensity of the UV irradiation and the AOP reactor configuration. A preliminary optimisation of the process indicates that excess dosage is not effective. In fact, test results show that UV power level 2, which is about 30% less than UV power level 3, is sufficient to achieve almost similar target reduction rate, resulting in significant equipment and operating costs reduction. Therefore, for cost effective AOP processes using UV in combination with ozone or hydrogen peroxide or both, these results confirm the need to take into consideration critical design factors such as AOP chamber geometry, UV intensity power and UV spectral distribution, the positioning of the UV light sources in the AOP reactor, and the water UV transmission. The rate of chemical oxidation of contaminant, TOC, COD is limited by the rate of formation of OH radicals, and in the case of low pressure UV lamps, by the small absorption cross-section of hydrogen peroxide (i.e 19.6 1/mol. cm) at 254 nm. Therefore, the use of standard UV systems primarily used for disinfection purposes, are not the right choice for AOP applications. Using standard disinfection UV systems in UV-based oxidation process scale up means higher capital and running costs. For illustration purposes, it is interesting to present here the typical case of an industrial project. 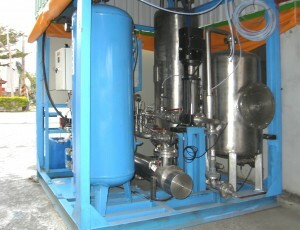 The application was about TOC reduction in process water for reclaim purposes. The specification called for TOC reduction from a 3 ppmC max. to below 0.25 ppm. An internationally renowned UV manufacturer proposed a UV/H2O2 solution where 19 x 5 UV system skids were used. The company offered their standard UV disinfection systems, high intensity low pressure lamps (254 nm) at a total UV power of 660 kW. The approximate budget for such UV plant alone was about 3.5 million USD. The present study suggests that the end user could have saved up to 1.0 million USD in equipment cost and no less than 30% in power consumption and spare part costs as well as labor costs associated with installation, commissioning and running of the plant. A chemical compound was used as a target model for the technical development and optimisation of a cost effective advanced oxidation treatment process. The oxidative destruction of the model compound in water was carried out as a function of AOP reactor design and geometry, residence time, UV intensity and spectral distribution of the light source. Technical scale results show that high degradation rates can effectively be achieved by taking into consideration several critical AOP design parameters and process optimisation. This study provides basic steps in AOP process technical development leading to significant reduction in capital and overall operating costs. 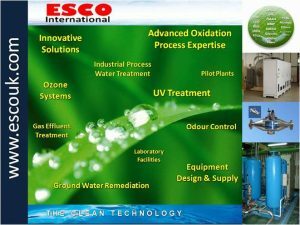 ESCO International technologies offer sustainable solutions to some of the most critical water and waste water and gas effluent challenges using latest advances in Advanced Oxidation Processes, Ozone and UV systems and technologies. ESCO International develops process technologies that enable water reclaim, reuse or recycle and address the most difficult challenges in treating process waters and wastewaters. Unlike many treatment solutions, the AOP technologies have no waste streams, are environmentally friendly, and deliver significant customer value, and has the advantage of no phase transfer required, thereby eliminating secondary handling. powerful oxidant available for water treatment. – Ozone generators, PSA Oxygen generators and ancillary equipment. An investigation into alternatives for refractory COD removal in industrial waste waters which is economically attractive and do not produce sludge lead to an evaluation of ozone based advanced oxidation processes. The results of this ozone based AOP pilot study indicate that refractory COD from pre-treated refinery wastewater effluent can effectively be destroyed and is a viable alternative to traditional chemical precipitation removal technologies for COD removal. The pilot study results show that the primary control parameters for COD and BOD removal using ozone based-AOP are oxidant dosage, contact time and pH. This report presents the results of the AOP pilot testing program. The ozone-AOP pilot plant consisted of a 6 m high column, operated in a counter-current mode. Ceramic diffuser and injector supplied ozone generated from a PSA oxygen source at specific gas flow rate and O3 concentration ranging from 6% to 12% wt. Ozone was monitored in the influent gas and the off-gas. Influent and effluent ozone dosages were monitored using an ozone gas analyser. Ozone concentrations in the feed-gas and hydrogen peroxide (30%wt) were adjusted to provide the desired oxidants concentrations. The removal efficiency of the organic compounds in the two waste water samples by ozone-AOP was measured in terms of COD and BOD5. 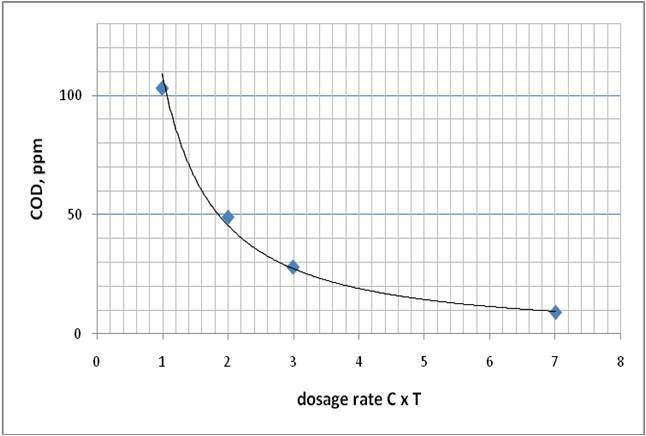 The correlation of COD removal and oxidant(s) dosage is presented in figure below. At low oxidant(s) dosages (Conc. x Time), there does not appear to be significant COD removal. This concurs with the observations noted in previous pilot tests that at low ozone (oxidants) concentrations there is not an adequate ozone dosage to break the long chain bond and colour. It is anticipated that there is little COD destroyed when the ozone (oxidant) attacks and does not break apart the carbon-carbon double bonds in the large, colour contributing, organic molecules. As the ozone (oxidants) dose is increased, carbon-carbon single bonds are attacked and broken, resulting in a loss of COD, BOD and TOC. At stoichiometric ozone (oxidants) dosages, COD removal rate is higher than 95%. The test results for COD and BOD5 of the two ozone treated waster water samples are summarised in Table 1. Table 1: laboratory analysis of untreated and treated samples. The graphs below (fig 1 and fig 2) show the COD reduction trends for samples A and B, based on pilot test results. The simulated pilot test results indicate that by simply increasing the ozone & H2O2 dose rates (Cx T), we can easily achieve less than 10 ppm in COD in both cases, if needed. Fig 1. COD reduction vs C.T ( concs. x time) for sample A. Fig 2. COD reduction vs C.T ( concs. x time) for sample B. An analysis of the AOP Ozone pilot tests for oxidative destruction of COD and BOD in industrial wastewater effluent was conducted. The results of this study indicated that ozone AOP oxidation process can efficiently remove COD to below 10 ppm without the generation of sludge. This eliminates the need for an additional treatment system and solid management program as is typically required with precipitation methods. 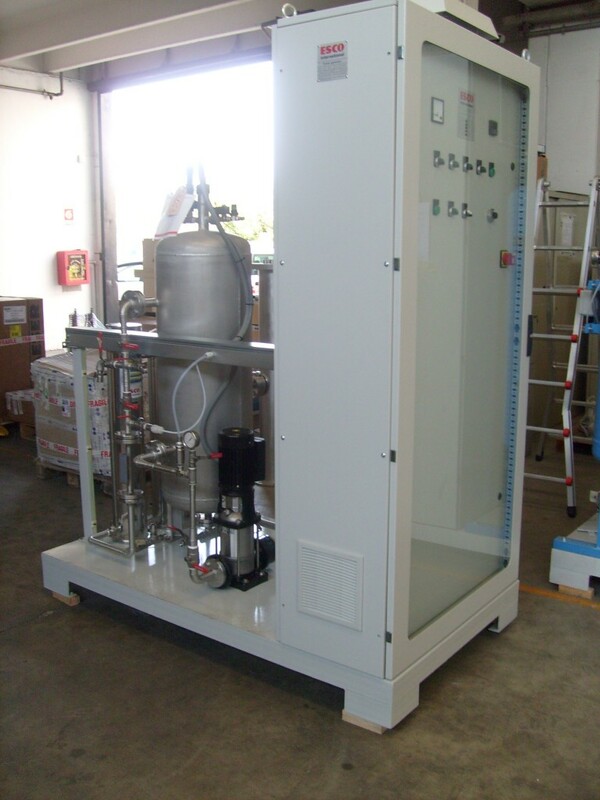 Kinetics have been developed for full scale AOP design which show that our high intensity mixed ozone based AOP reactor system design can provide highly improved kinetics and would result in lower ozonation dosage, hence, lower capital and running costs and smaller system footprint. For Professional solutions email: info@escouk.com or visit our website: www.escouk.com or call +44 (0) 1492 584140. The aim of this study was to investigate the use of ozone-based advanced oxidation processes for the oxidative destruction of COD in a petrochemical facility. Several AOP experiments were carried out in order to select and optimise the successful treatment option. A LABO3-AOP pilot unit was used where filtered waste water (COD 1250 ppm) was circulated throughout the AOP reactor and ozone & H2O2 injected at various dose rates using Venturi-type injectors. Treated samples were withdrawn from the test unit for COD analysis. The amount of ozone and H2O2 used in the COD oxidative degradation process were also monitored. The graph below shows the COD reduction trend based on laboratory test results. The results indicate that by simply increasing the ozone & H2O2 dose rates and reaction time, we can easily achieve less than 100 ppm COD as requested by the customer. Extended tests show that COD of less than 60 ppm can be achieved. Test results indicate that , under laboratorty testing & analytical conditions, the ozonation process can successully oxidize COD . Additional tests using a combination of ozone and H2O2, shows that COD can be further reduced to meet lower COD targets of less than 60 ppm. These laboratory experiment confirm that, under certain operating conditions, O3/H2O2 process is the most suitable solution for the oxidative degradation of COD . As a result, the petrochemical facility selected ESCO International for the submission of a full scale O3/H2O2 treatment solution design. This project demonstrates once more, ESCO International’s technical capabilities in providing advanced water treatment solutions to meet specific customer needs. email: info@escouk.com or visit our website: www.escouk.com or call +44 (0) 1492 584140. A chemical manufacturing plant needed to remove cobalt from biologically treated wastewater. The current cobalt concentration is higher than 1000 ppb and needs to be reduced to below 5 ppb. Cobalt speciation analysis results have shown that much of the cobalt is present as organically bound complexes. These complexes are known to be difficult to remove by adsorption, precipitation or ion exchange. The aim of this study was to test the use of advanced oxidation methods involving the combination of UV and oxidation agents (H2O2, Ozone) to degrade the organic ligands and recover Cobalt once it has been released from the complex. ESCO International explored the use of their advanced oxidation technologies to destroy TOC (max. 25 ppmC) and degrade the organic chelating agents. A number of AOP tests and process optimisation were conducted using different AOP configurations. TOC analysis was used in order to gather information about the oxidative destruction efficiency of the total organic compounds. As predicted, the selected AOP process turned out to be highly effective in the total mineralisation of the organic compounds (+90% reduction) and the subsequent complete destruction of the organic chelating agents present in the wastewater, thereby allowing the cobalt to be released and removed via adsorption, precipitation or ion exchange. This project demonstrates ESCO International’s technical capabilities in providing companies with state-of-the-art, sustainable water treatment solutions suited to their specific needs. ESCO INTERNATIONAL; a company specialising in Advanced Oxidation Processes, Ozone and UV systems and with the primary objective of resolving water pollution issues on a global scale, worked on a semi-pilot scale project with an internationally well-known company in the chemical & polymers production industry, based in US. Organic compounds of concern include BI, MI, BPA, HEG and NPI compounds, known as recalcitrant compounds but not bio-toxic. These organics are signature compounds from manufacturing process contained in wastewater and can be present in the effluent following Bio-treatment. Semi-pilot AOP trials were conducted to investigate the feasibility to destroy “signature organic compounds” to meet customer requirements. Treated samples were sent back to customer for HPLC analysis. TOC analysis was performed by an external laboratory using UV/Persulfate TOC method. AOP test results showed total removal of colour and signature compounds as illustrated in the figures below. In addition, TOC reduction of more than 95% was achieved, starting with initial TOC range of 130 – 515 ppmC down to less than 3ppm. The AOP process proved very efficient in total oxidative destruction of the signature organics as well as a significant TOC reduction. This project demonstrates ESCO’s main focus of providing companies with state-of-the-art sustainable and cost effective water treatment solutions suited to their specific needs. Fig. Signature compounds before and after AOP pilot unit. Both the public and local regulatory authorities are highly sensitive to odour nuisance. Odour problems originate from the use of chemicals and solvents in industries such as foundries, electronics, chemicals, petrochemicals and pharmaceuticals but also from sewage treatment plants, food production, tanning, animal rendering. Advanced oxidation processes are cost effective in destroying organic and inorganic odour-causing chemicals. Ozone-based advanced oxidation can successfully replace air pollution control processes based on chemicals such as hypochlorite, hydrogen peroxide and others. 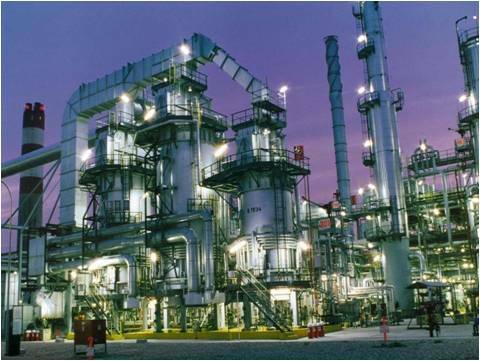 ESCO INTERNATIONAL; experts in solving water and gas effluent problems have designed and supplied a pollution control system for a refinery based in China. The challenge required the treatment of a 200 m3/h waste gas stream containing 2000ppm of THC as methane and 1000ppm mercaptans including H2S. The supplied process uses a combination of an absorption tower and an engineered ozone based advanced oxidation system, resulting in very high contaminants removal efficiency in the waste gas, a significant reduction in water intake and discharge and maximum water reuse. 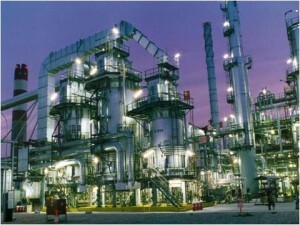 The final solution resulted in many benefits for the refinery such as reuse of the scrubbing water, significant reduction in water intake and discharge, total elimination of potential discharge violations, reduced service, maintenance and running costs, high reliability, compact footprint and allowing the company to take a big step in the direction of an environmentally friendly, economical and more sustainable future. ESCO International supplied a number of similar AOP systems for the treatment of contaminated waste gases containing Mercaptans, BTEX, H2S, VOCs, DMS, DMSO and alcohols, etc..
Glan Conwy, North Wales, UK. ESCO International, a company specialising in Ozone, UV and Advanced Oxidation Processes with the primary objective of resolving water issues on a global scale, has entered the final stages of a multi-million pound project with a large Oil & Gas company based in Russia. Following extensive site trials using a custom-designed industrial AOP pilot system, optimised results proved impressive for the company requirements. AOP pilot tests demonstrated significant drops in COD concentration, with an initial level of up to 300ppm to less than 50 ppm (limit required by the refinery). More interestingly the oil concentrations were also noted and showed very promising results, dropping from a maximum of 20 ppm down to less than 0.1ppm. Finally in terms of turbidity, tests demonstrated a drop from a maximum value of 4.50 FTU down to a minimum value of 0.20 FTU. After several successful re-runs the company decided to seek ESCO International’s expertise to design a full scale advanced oxidation system required to treat a flow rate of up to 900 m3/h. The water treatment facility will treat up to 22,000.00 m3 of water daily, which will be used primarily for recycle and re-use or environmentally safe discharge taking the company a big step in the direction of an environmentally friendly, economical and more sustainable future. This project demonstrates ESCO’s main focus of providing companies with state-of-the-art water treatment methods suited to their specific needs. For Professional Solutions contact us at info@escouk.com or visit our website: www.escouk.com or call +44 (0) 1492 584140.